The award-winning 2014-15 theater series at the Arts Center of Coastal Carolina kicks off with the American classic To Kill a Mockingbird, the audience’s number one non-musical pick. An American classic, To Kill a Mockingbird takes place in Alabama during the Great Depression, following the journey of Jem and Scout Finch. Their father has been appointed to defend Tom Robinson, a black man framed for a crime he didn’t commit. As the trial progresses, Jem and Scout witness their community in a tense tug of war between justice and prejudice. Harper Lee found instant fame after the novel was published in 1960 and was showered with literary awards, including the Pulitzer Prize for Fiction in 1961. To Kill a Mockingbird runs from September 30-October 19. 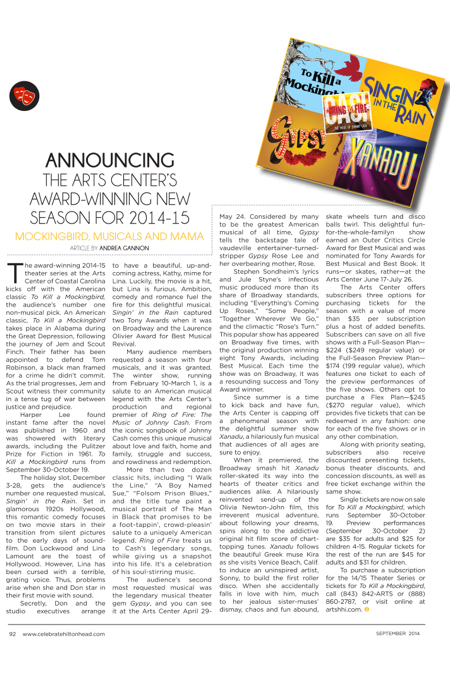 The holiday slot, December 3-28, gets the audience’s number one requested musical, Singin’ in the Rain. Set in glamorous 1920s Hollywood, this romantic comedy focuses on two movie stars in their transition from silent pictures to the early days of sound-film. Don Lockwood and Lina Lamount are the toast of Hollywood. However, Lina has been cursed with a terrible, grating voice. Thus, problems arise when she and Don star in their first movie with sound. Secretly, Don and the studio executives arrange to have a beautiful, up-and-coming actress, Kathy, mime for Lina. Luckily, the movie is a hit, but Lina is furious. Ambition, comedy and romance fuel the fire for this delightful musical. Singin’ in the Rain captured two Tony Awards when it was on Broadway and the Laurence Olivier Award for Best Musical Revival. Many audience members requested a season with four musicals, and it was granted. The winter show, running from February 10-March 1, is a salute to an American musical legend with the Arts Center’s production and regional premier of Ring of Fire: The Music of Johnny Cash. From the iconic songbook of Johnny Cash comes this unique musical about love and faith, home and family, struggle and success, and rowdiness and redemption. More than two dozen classic hits, including “I Walk the Line,” “A Boy Named Sue,” “Folsom Prison Blues,” and the title tune paint a musical portrait of The Man in Black that promises to be a foot-tappin’, crowd-pleasin’ salute to a uniquely American legend. Ring of Fire treats us to Cash’s legendary songs, while giving us a snapshot into his life. It’s a celebration of his soul-stirring music. The audience’s second most requested musical was the legendary musical theater gem Gypsy, and you can see it at the Arts Center April 29-May 24. Considered by many to be the greatest American musical of all time, Gypsy tells the backstage tale of vaudeville entertainer-turned-stripper Gypsy Rose Lee and her overbearing mother, Rose. Stephen Sondheim’s lyrics and Jule Styne’s infectious music produced more than its share of Broadway standards, including “Everything’s Coming Up Roses,” “Some People,” “Together Wherever We Go,” and the climactic “Rose’s Turn.” This popular show has appeared on Broadway five times, with the original production winning eight Tony Awards, including Best Musical. Each time the show was on Broadway, it was a resounding success and Tony Award winner. Since summer is a time to kick back and have fun, the Arts Center is capping off a phenomenal season with the delightful summer show Xanadu, a hilariously fun musical that audiences of all ages are sure to enjoy. When it premiered, the Broadway smash hit Xanadu roller-skated its way into the hearts of theater critics and audiences alike. A hilariously reinvented send-up of the Olivia Newton-John film, this irreverent musical adventure, about following your dreams, spins along to the addictive original hit film score of chart-topping tunes. Xanadu follows the beautiful Greek muse Kira as she visits Venice Beach, Calif. to induce an uninspired artist, Sonny, to build the first roller disco. When she accidentally falls in love with him, much to her jealous sister-muses’ dismay, chaos and fun abound, skate wheels turn and disco balls twirl. This delightful fun-for-the-whole-familyn show earned an Outer Critics Circle Award for Best Musical and was nominated for Tony Awards for Best Musical and Best Book. It runs—or skates, rather—at the Arts Center June 17-July 26. The Arts Center offers subscribers three options for purchasing tickets for the season with a value of more than $35 per subscription plus a host of added benefits. Subscribers can save on all five shows with a Full-Season Plan—$224 ($249 regular value) or the Full-Season Preview Plan—$174 (199 regular value), which features one ticket to each of the preview performances of the five shows. Others opt to purchase a Flex Plan—$245 ($270 regular value), which provides five tickets that can be redeemed in any fashion: one for each of the five shows or in any other combination. Along with priority seating, subscribers also receive discounted presenting tickets, bonus theater discounts, and concession discounts, as well as free ticket exchange within the same show. Single tickets are now on sale for To Kill a Mockingbird, which runs September 30-October 19. Preview performances (September 30-October 2) are $35 for adults and $25 for children 4-15. Regular tickets for the rest of the run are $45 for adults and $31 for children.